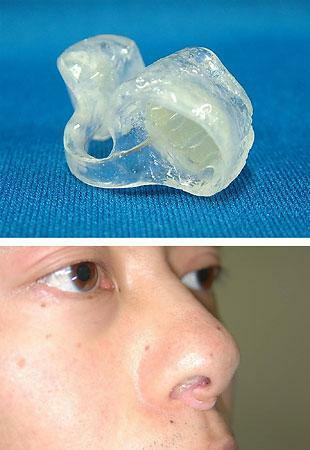 On June 20, an Okayama University team of researchers led by Professor Shogo Minagi unveiled a nasal airflow regulator designed to alleviate voice loss such as that which sometimes occurs after a stroke. In normal speech, the soft palate (located at the back of the roof of the mouth) works to regulate the amount of air expelled through the mouth and nose. When these nerves are damaged by a stroke, for example, the soft palate may sag, preventing air from escaping through the nose. The result is the inability to pronounce speech sounds. When inserted into the nostrils, the device forces air through the nasal passage when speaking, enabling sounds to be produced. According to the developers, the device allows people with nasal airflow problems -- even those whose speech is all but inaudible -- to be clearly heard. I want to know whether this ariflow reglator helps restrict air into the nose because my brother recently under went turbinate reduction surgery due to which he is experiencing more air-flow into the nose. He want to reduce the air-flow. Can you suggest me whether this regulator will help in decreasing airflow?